Carroll's guests are Ronnie Graves and Allan Schwartz, former members of the Humane Society of the United States (HSUS) Emergency Rescue Team. After the problems we exposed with the Pang Animal Haven "rescue" by HSUS, we found many others have also raised concerns regarding HSUS' unprofessional conduct and "unethical" and inaccurate publicity. Most of the emergency team have resigned due to these issues. 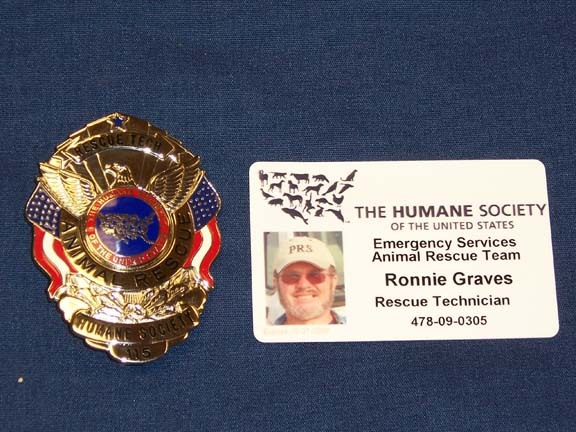 This is the badge used by emergency rescue team to make them look like official law enforcement officers.